Canadian crypto exchange QuadrigaCX went belly-up this week — after a year or so of increasing problems. On 14 January, QuadrigaCX told the world how CEO and founder Gerald Cotten had died from “complications with Crohn’s disease” … a month before, on 9 December 2018. I can’t speak to the troubles Americans are having cashing out, but Canadians can do so quite easily at QuadrigaCX. No ID required, just an email 2FA. I used Interac eTransfer and the money was to me in about 12 hours. That said, I don’t know how easy/fast this would be during a rush for the exits should it come to that. In January 2018, the Canadian Imperial Bank of Commerce (CIBC) froze CAD$28m (archive) of funds from Quadriga’s payment processor, Costodian Inc, and its CEO, José Reyes — because CIBC literally couldn’t determine whose money it was. This includes CAD$2.3m that had been routed into one of Reyes’ personal accounts. CIBC tried to contact Cotten repeatedly in the following months — but he didn’t respond. The dispute finally reached court in October. 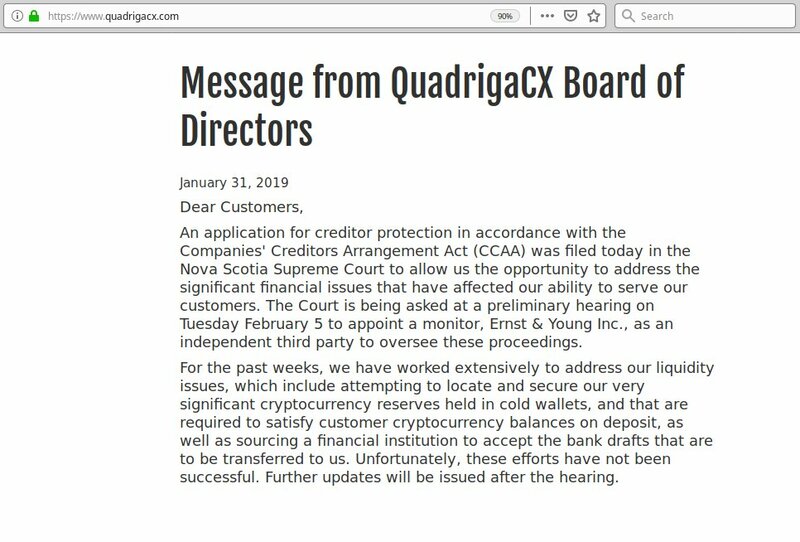 CIBC asked the court to determine whether the funds belonged to Quadriga, Costodian or the 388 Quadriga customers who had deposited it. Payouts had been slow through 2018 because of the CIBC seizure — Cotten said he had even run some payments through his personal accounts. But by December, payouts had all but stopped — and Reddit /r/QuadrigaCX was a sea of customer complaints. One Reddit user, “PoopieMaster101,” said they’d received $18,000 on 21 January — though they still had another $50,000 on the exchange when it closed. Other users reported withdrawals being marked “complete” on the exchange, but with no money showing up in their bank account. Worse yet — crypto withdrawals were being delayed. There’s no excuse for this — cryptos go straight from the exchange to the customer. This gets people thinking the exchange just doesn’t have the cryptos. Cotten’s death was announced by Jennifer Robertson, who had married Cotten in October 2018. They’d been a couple for a few years. On 27 November, two weeks before he died, Cotten had signed a will (archive) appointing Robertson as his executor. He also left CAD$100,000 to take care of his two dogs. Robertson submitted a petition to the Supreme Court of British Columbia on 22 January asking for a shareholder’s meeting to elect new officers to Quadriga Financial Solutions and its subsidiaries that ran the exchange — because Cotten’s death had left the corporations with no officers or directors. Per the petition, the owners of QFS were Cotten (43%), Lovie Horner (11%), and Horner’s partner Mike Patryn (most of the rest), with some other minor shareholders. The shareholders met 25 January, and new directors were appointed — Robertson, her stepfather Thomas Beazley, and Jack Martel (whoever he is). Robertson filed an affidavit with the Supreme Court of Nova Scotia on 31 January to support the bankruptcy filing — the companies are incorporated in BC, but she and Cotten lived in Nova Scotia. Cotten and Patryn had hoped to take Quadriga public in 2015 — “the world’s first publicly traded Bitcoin exchange” — but this didn’t end up happening. Instead, it became a one-man show, run by Cotten. The exchange did not have an office (which is why some of the listed addresses turned out to be UPS store mail boxes) — “Most of the business of the Companies was being conducted by Jerry wherever he and his computer were located.” The servers were in the cloud, on Amazon Web Services. As I said in chapter 4 of Attack of the 50 Foot Blockchain — leaving your coins on an exchange is like keeping your money in a sock under someone else’s bed. Robertson thinks there are cold wallets somewhere, but can’t find them — Cotten’s laptop is encrypted. Cotten had also mentioned storing Quadriga coins on other exchanges. But at present, Quadriga has no access to those coins. There was an unconfirmed rumour on Saturday that a Litecoin cold wallet had been located — and was being drained. This looks like it was incorrect. Twitter poster CryptoMedication, editor of crypto news blog Zerononcense, has compiled a list of on-chain evidence (archive). He couldn’t locate any cold wallets — that is, any mostly-quiet addresses that received coins from the daily hot wallets. As far as he could tell, QuadrigaCX was paying out withdrawals — both actual money and crypto — as they received incoming funds from depositors. CryptoMedication is pretty sure the cryptos have been stolen, and regards this, not as an exchange suffering a misfortune — but as a theft. There is persistent rumour on the QuadrigaCX subreddits that Mike Patryn was formerly known as Omar Dhanani, who pled guilty in 2005 to identity theft and credit card fraud — and that all this must therefore be an exit scam on Patryn’s part. But I can’t find any solid link, and more than a few claimed links that don’t check out — including that Patryn was also fraudster Ayaz Dhanani. This other Dhanani was jailed in November 2018, so probably wouldn’t be participating in petitions to the BC Supreme Court. So I wouldn’t lend credence to this one at this point. Update: Of course, I might be wrong. There’s a lot of people who’ve been ripped off badly by this — the largest individual loss is CDN$70 million (archive) — and want to know what happens next. QFS has filed for bankruptcy protection under the Companies’ Creditors Arrangement Act. They are going to court tomorrow, 5 February, to appoint Ernst & Young as the monitor — the Licensed Insolvency Trustee. The court will almost certainly give QFS a 30 day stay on all proceedings, so QFS and E&Y can sort out just what the situation is. If you have dollars or cryptos stuck on QuadrigaCX, you are an unsecured creditor at the least. QFS and E&Y will go through the existing accounts to determine what creditors they can find. At the end of the 30 day stay, QFS and E&Y return to court to detail their progress so far, and justify any extension of the stay. Note that the claims process can take many months. Don’t expect this to be resolved soon. The hot forum for news and research — and wild speculation — is Reddit /r/QuadrigaCX2. …. but because some of our pages mention quadriga bucks instead of $$, we totally arent dealing in $$, and totally arent a $$ depository institution. Well, glad I was only putting toes in the water and seeing if the company was any good. $500 between ETH and BTC is far less than 70mil, makes me a little less annoyed. Stupid greedy people always have to ruin it for the rest.